Social media marketing has revolutionized the way young startups gather and interact with their target audiences and consequently it has influenced the way that we gather potential new customers. Social Media marketing is a good way to test your Minimum Viable Product assumptions and gather user requirements. It may also help when searching for a monetization model, and nonetheless aids in finding users for the beta release of your Minimum Viable Product. There are four keys to utilizing the power of Social Media. First is understanding the different methods and possibilities available when using social media. Second, prepare a plan for what is needed and expected from using the social media. Third, design and test the methods you plan to use to achieve your goals. Finally, execute your strategies while continuously adjusting your techniques and method, depending on the results you get. Social media marketing needs a lot of attention and requires constant adjustments, especially when interacting with users. It requires an ongoing involvement in the online community, and it would be wise to periodically adjust one’s approach when reaching out to different communities. Depending on the unique characteristics of your specific target audiences in each community you engage with, this learning process never stops. The right time to start planning your Social Media marketing campaign is early. It is important to engage with social media while you are still envisioning how your product will perform and when you are still in the early stages. A common mistake is to turn to social media only when your product has already been developed. Instead, I think that one should use social media to reach potential users before the product reaches the market. Harnessing the power you can unleash by way of social media marketing comes from researching what others are doing, and this is perhaps the strategy for understanding what can be achieved for yourself. Not every start-up unveils their marketing tactics fully, but there is enough data, knowledge, and shared information out there, to provide you with a good picture of how it is done successfully and how to incorporate this power and utilize it. 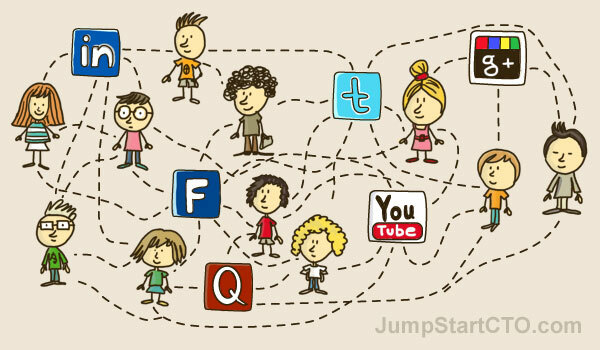 Gathering requirements –Use social media as a way to contact users. Once they are engaged in the right way, they might be will be willing to share their ideas and help in the process of gathering user requirements for your Minimum Viable Product or as the product evolve for the future releases of your product. Getting Feedback – By creating a long time relationship of trust with your community, this will eventually translate into finding loyal members who will continually offer to provide feedback to you as your product progresses through its various stages of development. Beta Users and Beta Testing –By launching to a limited number of Beta Users, you can create a line of communication for them to send you feedback when they first begin using your product. Consider the amount of effort that will be needed for each social media platform. There is a learning curve that you have to endure before the medium can be properly understood and made the best use of. Choosing the right social media platform depends on the relevancy of your product in relation to the audience using each social platform. Take into consideration the potential to reach a large amount of audience versus the amount of effort it takes for you to reach them effectively. Consider all the different flexibilities and possibilities that the platform enables. For example, find out if the platform allows you able to focus on your specific community and advertise to users based on specific profile criteria. Since the effort required for each social platform can be high, and because your resources and time are always limited at the start, it is recommended that you focus initially on fewer social media platforms rather than more. It is more important to excel at using just a few than it is to take on more than you can handle. Getting users engaged in the process is the key to keeping them and to be able to go back to them for repeated sessions for feedback. Engaging users in social platforms can be a longer process than initially anticipated. Because you are required to verbally interact with users in an engaging way, this can be time-consuming and be a profession of its own by itself. Engaging users can be a long term process which requires daily maintenance and not just quick in-and-outs to post a message, this is also important for achieving trust with your audience. The success of your social media marketing strategy depends on it. Adjust and adapt your social media approach as soon as a new process unveils itself to you. It is also important to be able to engage different types of users from your defined target audiences, the ones who are both savvy and novice. Adjusting the way you appeal to them can help to reach a broader amount of audience members. This again is part of the profession that is focused on engaging users and this basically means that you need to understand your audience very well in order to engage them. Sometimes engaging your users comes in the form of a bait you place out for them. For example, you can stage a contest or a ‘special offer’ that aligns your goals with the real goals of the community you are involved in. As another example, a young startup that I recently met posted several share-a-ride offers in several communities of students travelling from campus to their home location. This method of outreach helped them convert users from the social network into users of their app! This further helped connect with and meet more users and test different ways of engaging them. One of the great values of Social Marketing is in the platform’s ability to measure the effectiveness and conversion rates of your efforts. This can be done by using dedicated landing pages and tracking codes to understand who comes from where and what activity follows from what effort. Over time the effectiveness of your efforts should be measured in your ability to reach users according to your set desired goals and to continually work to bring more users to your site to promote your product. By developing a Social Media Strategy for your startup, you can get ideas about your Minimum Viable Product requirements prior to developing your product. This is a great way for you to meet your audience, give you an opportunity to listen to what their needs are, to gather user feedback, and to encourage them to use your product or encourage them to perhaps even refer it to their friends. Succeeding with your social media strategy requires that you invest a major amount of your time in researching and understanding all the possibilities that it opens up to you. You may want to invest even more time when it comes to eventually executing the strategy towards your goals. It is also important to consult with a social media expert on how to develop effective strategies. Someone with the right experience to help you to find and develop your own social media strategy and to teach you the right methods and techniques of how to engage your users in the most effective ways.